I’m laying on the floor on the flat of my back staring upward at the Madonna of the Immaculate Conception whispering a frenzied prayer that my camera – angrily blinking a low battery warning – won’t die. Meanwhile, a handful of gracious Italians, who have just completed evening prayers, seem bemused watching me wiggle around on the floor of Capella Madonna dell’Archetto (Our Lady of the Arch) trying to get a full frame image in my view finder. They don’t seem to mind in the slightest. 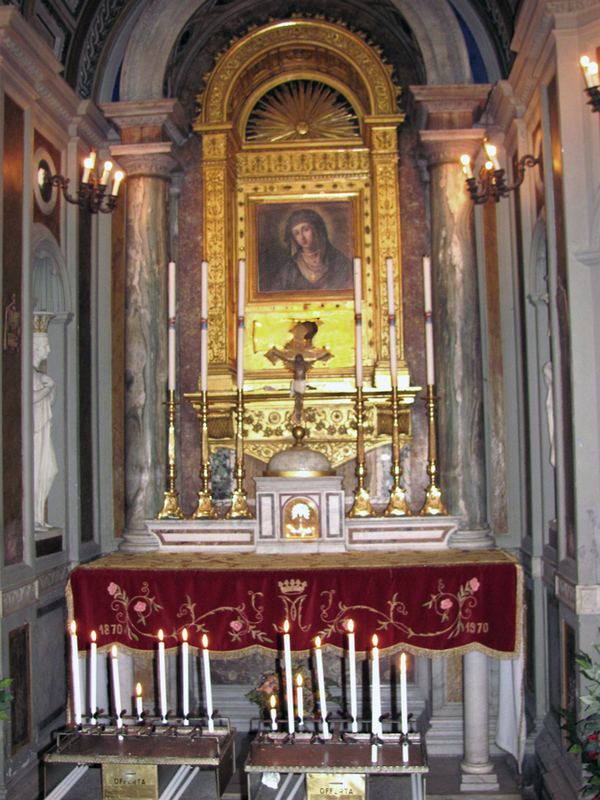 In fact, it seems to me they are honored that I am going to such trouble to shoot images of the artwork, in what is arguably the smallest Marian chapel in Rome, painted by one they hold in very high esteem. How is it that I come to be in this comical situation? Part of my annual vacation ritual is a visit to the small chapel tucked quietly down an alleyway off Via San Marcello in Rome’s historic Trevi District just northwest of the Capitoline Hill area. Three years ago I shot many of the same images of the chapel’s interior and upon returning this year was greeted just as warmly as on my previous visits. Inwardly I was pleased that neither the images nor the kindness of the people who greeted me had diminished. 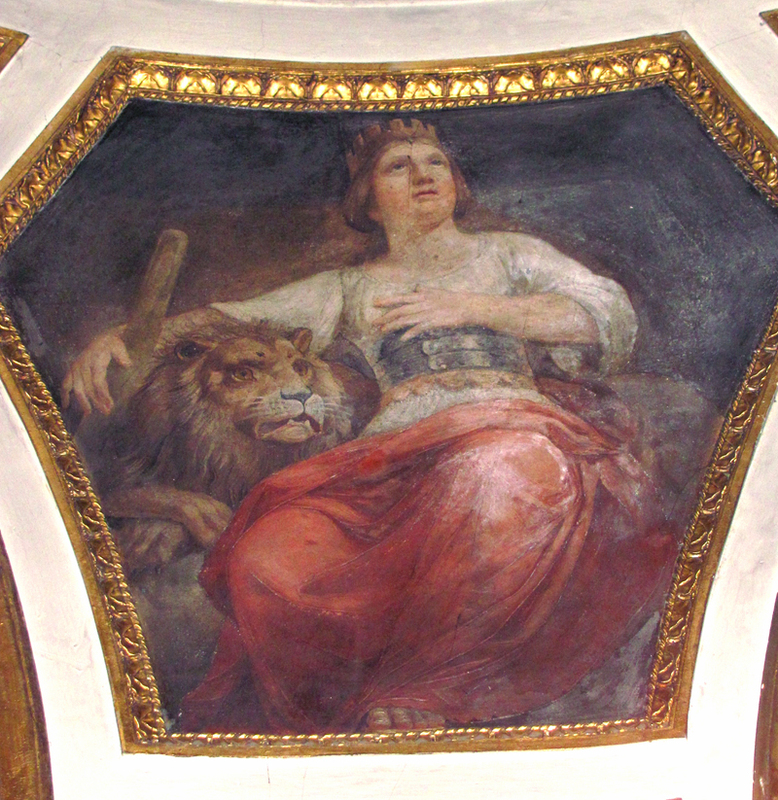 With pride they point out “Constantine” (vs. Constantino) Brumidi painted the images – the same Constantine Brumidi who painted inside the American Capitol. And though he may not be well known throughout Italy, or anywhere else in the world for that matter, in this tiny corner of Rome, his supporters point out his art – panel by panel – with obvious pride. In the back of my mind I keep thinking: “Snap a few photos, make a few friends” and somehow that seems to be a very fair trade. The chapel itself is very small and features a remarkable collection of neo-Renaissance art for its size. 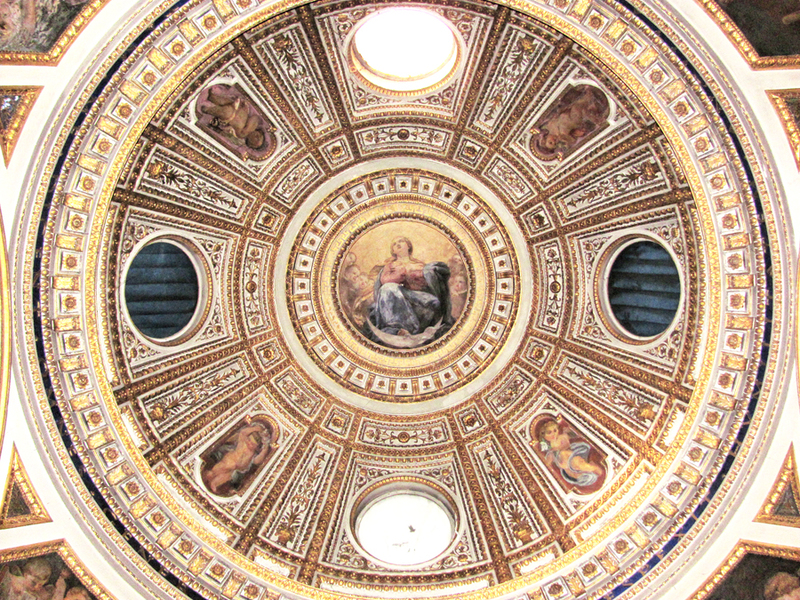 The oculus of the dome over a small altar area features Madonna of the Immaculate Conception – an image of the Virgin Mary, arms crossed over her heart, gazing off towards heaven surrounded by a small group of cherubs or putti (chubby cherub-like creatures), whichever best meets your eye or preference. 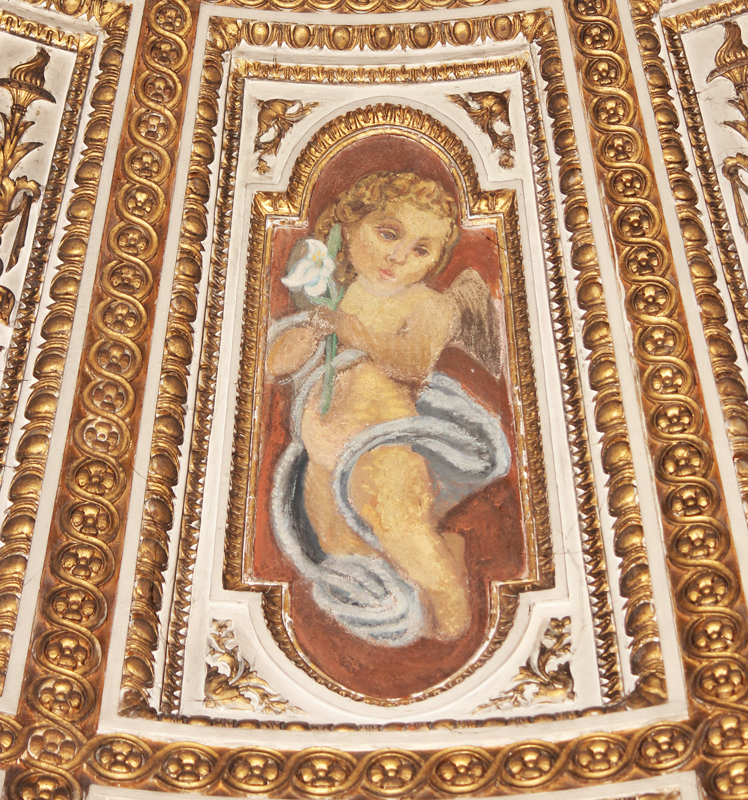 Cherubs – some of Brumidi’s most endearing and frequent subjects – appear in panels lower on the dome, itself intricately and ornately patterned in golden hues. Combined with rich marble panels, the chapel gives off a distinctly regal aura. 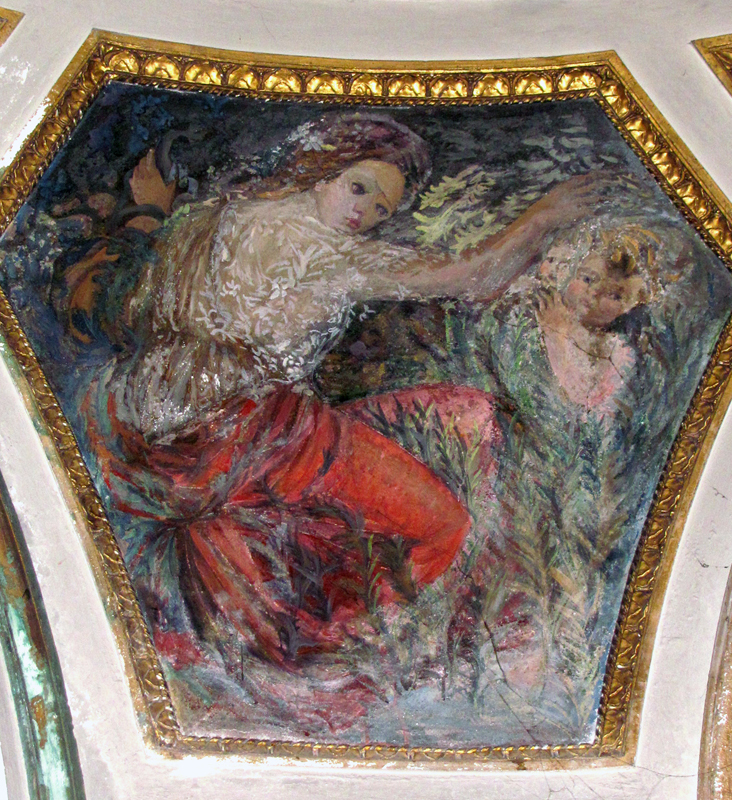 Four penditives – concave triangular areas connecting the overheard dome and its base – feature the allegorical virtues of Wisdom, Innocence, Strength, and Prudence. 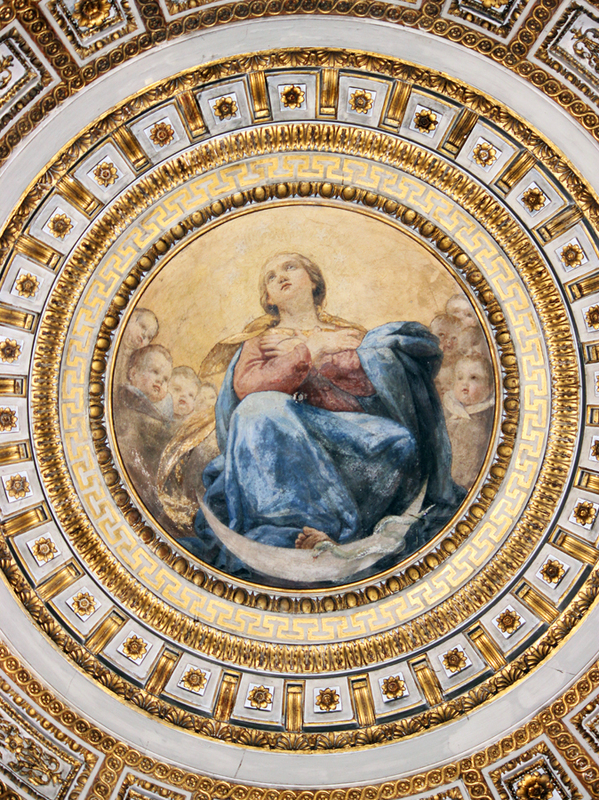 Though at least one shows clear signs of heavy over painting they still give a nice glimpse of Brumidi’s work on the chapel in the 1850-51 era – most likely his last work before immigrating to the United States in 1852. Marble angels flank the small altar whose center piece is a gem painted in 1690 by Domenico Muratori of the Virgin Mary causa nostrae letitiae (cause of our joy)– whose eyes, according to local legend, in 1796 appeared to weep and rotate on the painting because of the French invasion of the Papal states. Two days earlier, I had shot more Brumidi artwork at Rome’s Villa Torlonia but the setting, though elegant and classically designed, lacks the intimacy and character of this tiny chapel. Pound for pound and square inch per square inch, the tiny chapel holds its own against its much larger and more famous siblings scattered across Rome. With a simple “Buona Pasqua” I was off into the Roman evening and more adventures. Reflecting back, I think the chapel is a very special place. Two days later, I was very fortunate to spend Palm Sunday in St. Peter’s Square but the simple warmth of the people at Madonna dell’Archetto was almost as meaningful in its own way.